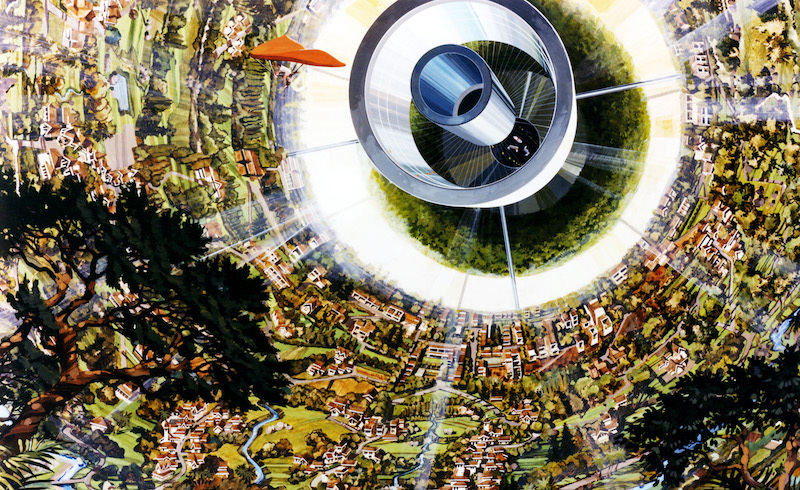 NASA rendering of the interior of a Bernal Sphere, drawn by Rick Guidice and Don Davis, 1975. via Wikimedia Commons. Set 15 of our Radical Thinkers series brings together four classic works in the history of science, including The World, the Flesh and the Devil: An Enquiry into the Future of the Three Enemies of the Rational Soul by J.D. Bernal, the pioneer molecular biologist, crystallographer, and theorist of the social relations of science. Bernal's first book, published in 1929, The World, The Flesh and the Devil "is," McKenzie Wark writes in his introduction, "a text that distills all the ambitions of an age, whether scientific, political, cultural or even religious. For Bernal, utopian thought ought to replace religion as a way of feeling out the relation of present to future. In place of heaven or apocalypse, he offered a kind of writing that finds the conditions of the possible in language itself." Below we present the book's first chapter. There are two futures, the future of desire and the future of fate, and man's reason has never learnt to separate them. Desire, the strongest thing in the world, is itself all future, and it is not for nothing that in all the religions the motive is always forwards to an endless futurity of bliss or annihilation. Now that religion gives place to science the paradisical future of the soul fades before the Utopian future of the species, and still the future rules. But always there is, on the other side, destiny, that which inevitably will happen, a future here concerned not as the other was with man and his desires, but blindly and inexorably with the whole universe of space and time. The Buddhist seeks to escape from the Wheel of Life and Death, the Christian passes through them in the faith of another world to come, the modern reformer, as unrealistic but less imaginative, demands his chosen future in this world of men. First and always, it is necessary to exclude as far as possible, illusion; for to most of us the future is the compensation and fulfilment of all that the present and the past have lacked; and the future being unknown and incontrovertible has been a fair ground on which to place all these hopes and desires. But in scientific prediction these desires are the most delusive guides. The opposite danger is as great and more insidious: in our lives we take the present for granted to an extent far greater than we can realize, so that even when we are thinking of the future we cannot separate the historic accidents of the society in which we were born from the axiomatic bases of the universe. Until the last few centuries this inability to see the future except as a continuation of the present prevented any but mystical anticipations of it. Luckily these complementary errors affect different parts of the future. It is in the near future where we are still sympathetically related to men and events that our desires have the most power to twist our appreciation of facts. We care less about the more distant future, but to approach it at all we must divest ourselves of so many customary forms, that even the more enlightened prophets let their imagination stop in some static Utopia in despite of all evidence pointing to ever increasing acceleration of change. What positive ideas can be found to take the place of the naïve anticipation that the future will be like the present but more pleasant (or more unpleasant according to one's disposition)? The leading principle is that by which Lyell founded scientific geology: the state of the present and the forces operating in it contain implicitly the future state and point the way to its interpretation. We have three disciplines of thought to help us to this interpretation. History (of which human history is only a minimal part) tells us how things have changed and how by inference they will change in the future. Strictly, prophecy should be treated as part of history, but, until history has found its laws, it must chiefly be used as a storehouse of illustrative facts; though one might say loosely that everything that will happen must conform with the spirit of History. The physical sciences, as far as we know them, give us the material of which future as much as past is built, and the manner of that building. The manner appears to us as physical law but it may well be found to be a tautology which we are congenitally too limited to grasp. Lastly there is the knowledge of our desires, but though the future according to our desires, is an illusion, our desires are, paradoxically, already tending to be the chief agent of change in the universe; it is only that the actual change is so rarely the desired change. The initial difficulty in the general prediction of the future is its enormous complexity and the interdependence of all its parts; but this complexity is not completely chaotic and we can always attack it by considering it as a product of chance and determinism, chance where we cannot see relationships, determinism where we can. The events out of which so complicated a thing as the general state of the universe is built, form neither one indivisible whole nor a set of equally independent units, but consist of complexes (nebula, planet, sea, animal, society) of which the components are themselves complex parts. This hierarchy of complexes is not imagined to have any objective validity, it is only an expression of the modes of human thought, a convenient simplification which makes science possible. Inside each complex, development proceeds according to its own rules, determined by the nature of the complex; but these rules always include, if they do not entirely reduce to, what is, in effect, the statistical chance interaction of complexes of a lower order. The death-rate of a town, for instance, can be shown to be a function of the amount of money it spends on sanitary measures, but the individual deaths appear, from the point of view of the town, to be due to chance circumstances, though again for each individual concerned they are determined. We can always leave out the higher complexes when we are considering the lower. An atom of oxygen will respond to its environment in the same way in a nebula, in a rock or in the human brain. Now the complex we are concerned with here is the human mind, and so we can fairly start with the assumption that the rest of the universe goes on its way determined by its physical, chemical, and biological laws except in so far as man himself intervenes. Absolutely, we know hardly anything of these laws, but relatively to our knowledge of human behaviour we know them so well that the future they present — the astronomical, geological, biological future — seems a fixed and stable thing. In human affairs the immediate future reveals itself in the following of tendencies visible in the present; beyond that must come the application and development of present knowledge. This is the minimal basis for prediction; but our present knowledge carries with it the implication of still further advances in knowledge along the same lines. It is the applications of this new knowledge and the secondary results that flow from them that will chiefly concern us, because it is clearly impossible to go further and include unimagined discovery. Of course, there is a considerable chance that one of the unpredictable discoveries will be so important that it will turn aside the whole course of development. But to be deterred by this chance would be to abandon any attempt at prediction. Already the chance element comes in when we consider applications or developments of knowledge in more than one restricted field; because although we can predict the development in that field fairly well, we cannot predict the rate of development; and so the rates of development in different fields, which are constantly reacting on each other, being unpredictable, the resultant future becomes more and more uncertain the farther we look forward. The only way to deal with this complexity is by separating the variables as best we can, by arbitrarily considering developments as proceeding in one field without any developments in any of the others, and then combining the results attained by applying this method in different fields. At the same time we must keep in mind that the state of development at any one period must be a self-consistent whole. Each line of development must have reached the level which is implied by the necessities of any of the other lines: for instance, the chemical control of life requires the development of chemical technique and apparatus of a very high order. On the other hand, whole sections of certain developments may become superfluous owing to developments in other fields; for instance, the manufacture of synthetic food and the industry connected with it would be unnecessary if blood were used directly as the motive power for animals.